One of Freds dreams came true: He spent the weekend with Elisa. 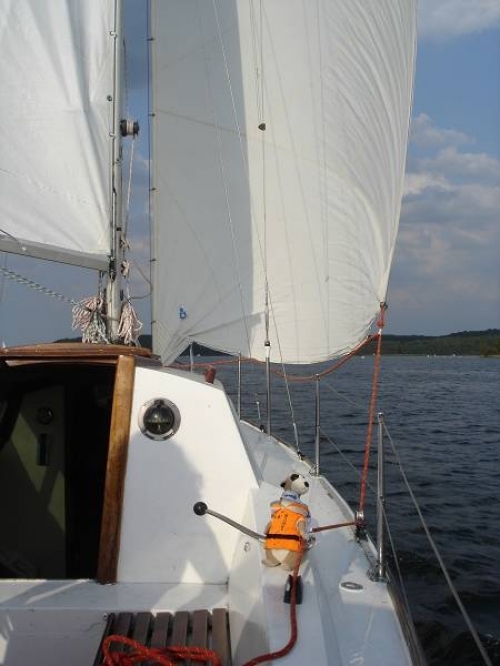 Elisa took care of Fred during the test of sailingboats in Neustadt. There he was allowed to creep into her coat, because he was cold. This time they went off to Travemünde. Unfortunately her friend Michael joined them. But Fred already knows him from the editorial office and in fact, they come along with each other. 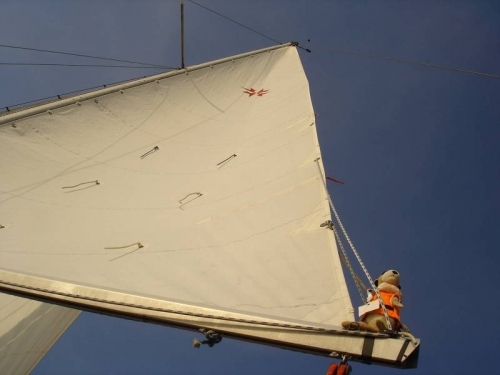 They immediatley set sails and Fred as an experienced deckhand had everything under control. Fred has already been in the Bay of Lübeck and anyway, he knows what has to be done. 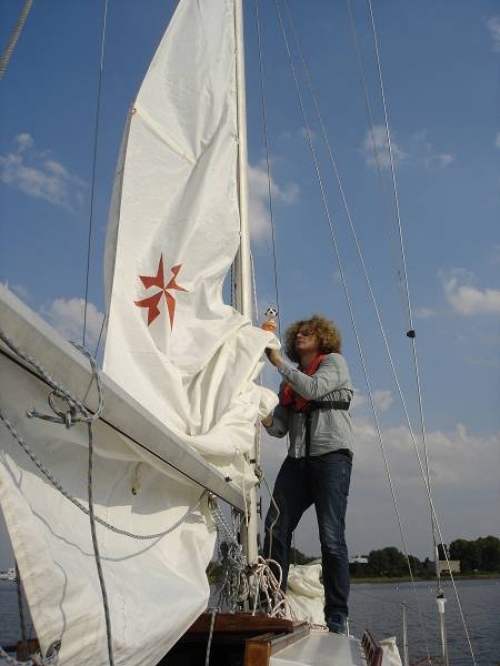 Setting sails, trim of sails - no problem. 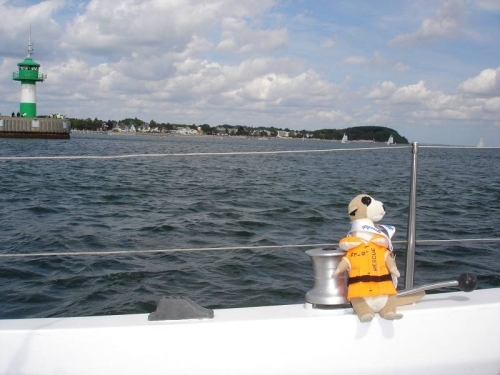 Most of all Fred loves to sit on the bow and watch the sea. 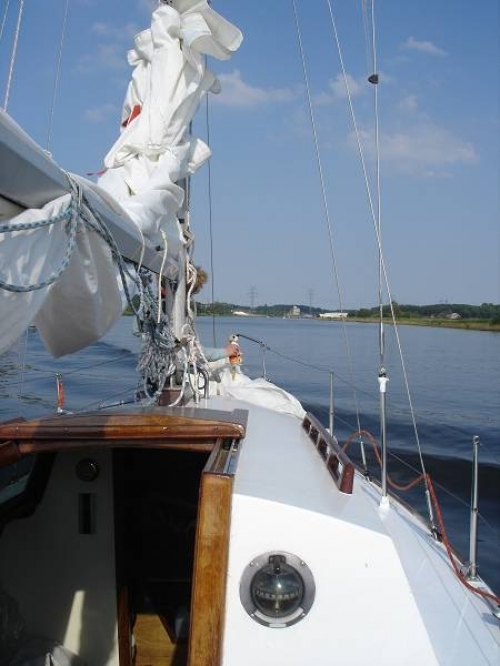 This time it was a little bit rough and he had to cling to the pulpit, hoping not to fall overboard - he was scared to go back to the aft all by himself. Michael came along to give him a hand and helped him back safely to Elisa in the cockpit. In the evening Elisa and Michael wanted to go ashore to have a beer. 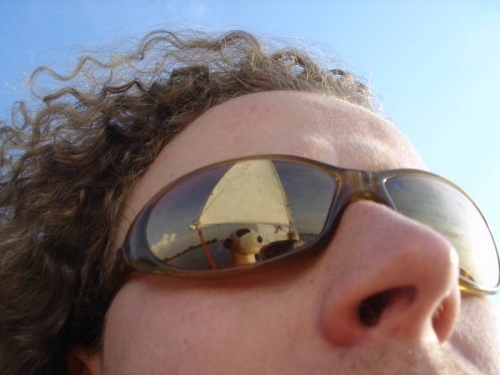 Fred stayed aboard and took care of the boat. Of course he had longing glance over to the promenade. Fred would have loved to come along, but Michael did not want to take this risk remembering what happend in the office after Fred drank the liqueur. Fred was a little disappointed, but calmed down quickly. 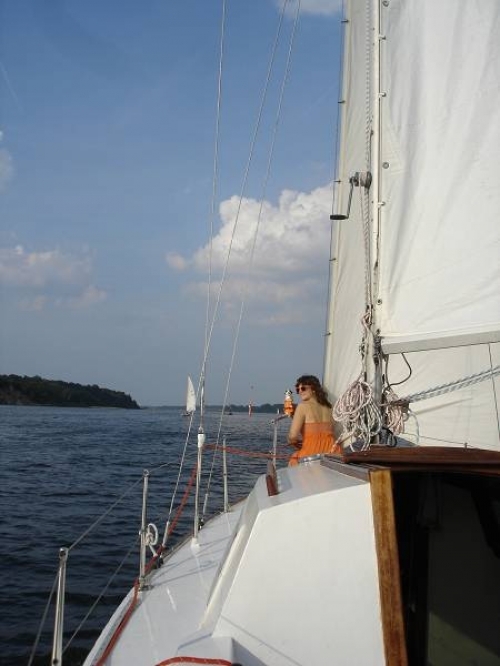 The next day they went sailing again and the weather was just perfect. 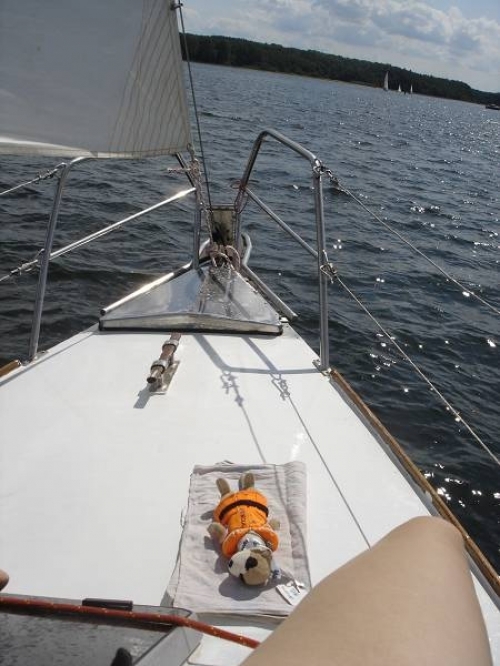 Fred enjoyed the time out, settled comfortably and let the sun shine on his belly. On their way back, there was hardly any wind, so they had the engine running as well. Suddenly the engine stopped and could not be started again. 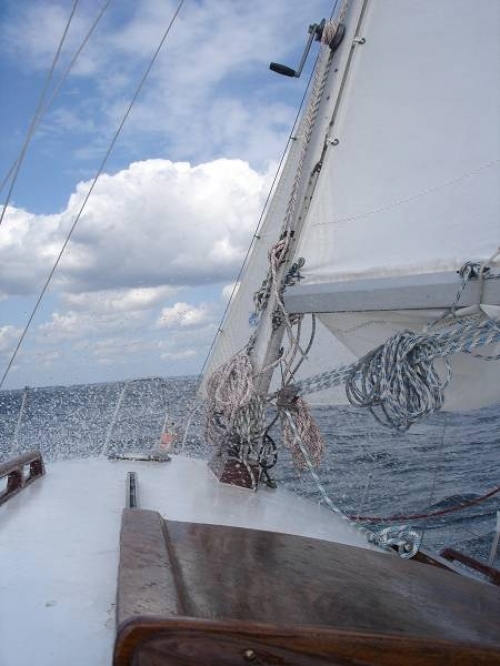 So they had to sail back with very week winds. Immediate suspicion fell on Fred. 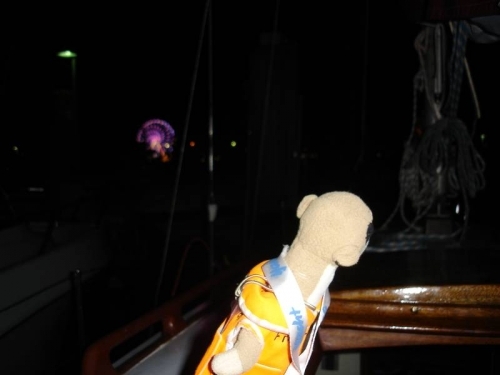 First of all, this had never happend before, second, Fred was on the boat all alone the evening before and third, he now really enjoys sailing - he does not want to hear any noise from the engine. Michael suspects therefore that Fred could have manipulated the engine. 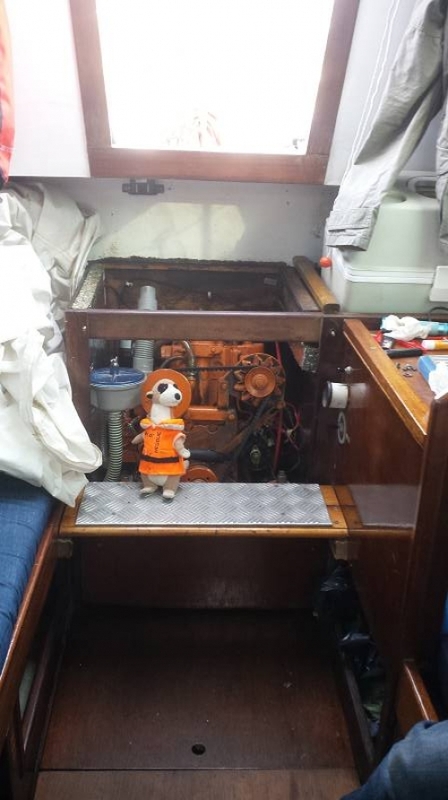 But to be honest, Fred seams to be longing to travel on big ships with big engines. 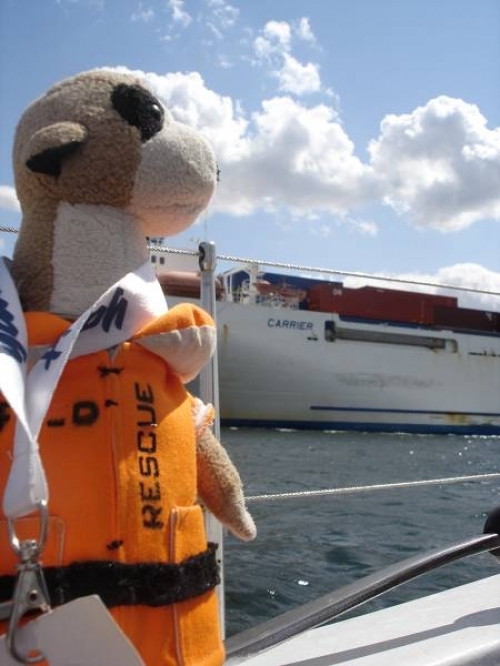 As we passed a containervessel on the river Trave, Fred waved to the crew and probably thought of all the adventure he already experienced on seagoing vessels.